bird nature art. roman numerals wedding ring. espresso wall vase. porcelain ornament. dipped aqua mug. california state map print. signature bracelet. you are home to me. hanging ceramic planter. Today's installment of beloved Etsy finds is purely inspired by my love for home and that special comfort home brings. Dorothy Gale knew what she was saying when she repeated, "There's no place like home." There really isn't. It's my safe place. My refuge. My place of refreshment and rejuvenation. I love my home. 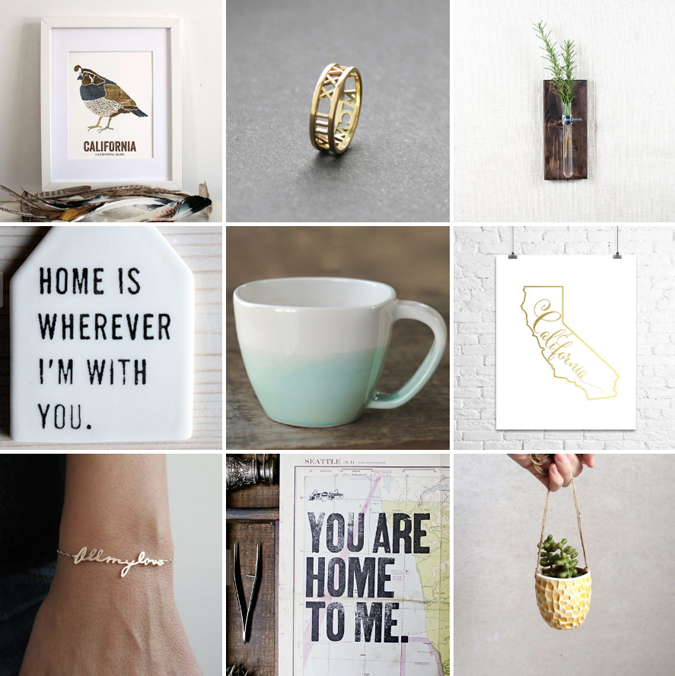 Whatever and wherever home is for you, I hope you'll be inspired by these amazing pieces (and maybe even snag a few up for yourself or loved ones!) Head on over to those Etsy shops and show those awesome artists some love, will ya? I love the bird prints!! And basically everything else on this list :) So many pretty things! I love all of this! You have great taste. I'm definitely planning to have a "home" sign like that in my next house. The bird print is my favorite! You have good taste, friend! Right?! I wish I didn't have a bajillion mugs already, because that mug = love. I would say you're safe at 2 dozen! So glad this was inspirational to you! I love all of these--but especially that home to me print. Gorgeous. You are awesome! I too am obsessed with this color, people that know me call it briblue! Thanks for the recipe and a fun to read blog! Can you first a cake the day before with it?